Habitat for Humanity of Williamson-Maury (HFHWM) is a faith based organization creating partnerships to build affordable homes, develop stronger communities, and provide life-changing opportunities for hard-working families. HFHWM brings people together to build homes, communities and hope. Donations include: furniture, appliances, cabinets, granite counters, plumbing fixtures, lighting, etc. 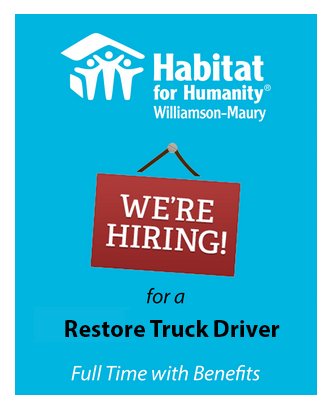 Habitat for Humanity Williamson-Maury County is an Equal Opportunity Employer.